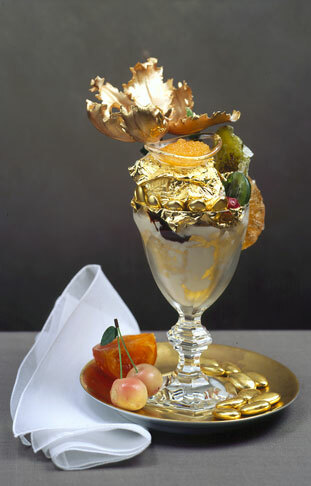 World's most expensive ice cream | The Golden Opulence Sundae is the world's most expensive ice cream. The Golden Opulence Sundae priced at $1.000 (just for a cup). The Golden Opulence Sundae contains Tahitian vanilla beans, candy fruits from Paris, Cherry Marzipan, decorated with leaves of pure 23 carat gold, and sprinkled with chocolate Amedei Porceleana. The Golden Opulence Sundae is served in a cup-shaped glasses which is made ​​of crystal and a spoon made ​​of 18 carat gold. For the topping is golden colored sugar flowers from Ron Ben-Israel.